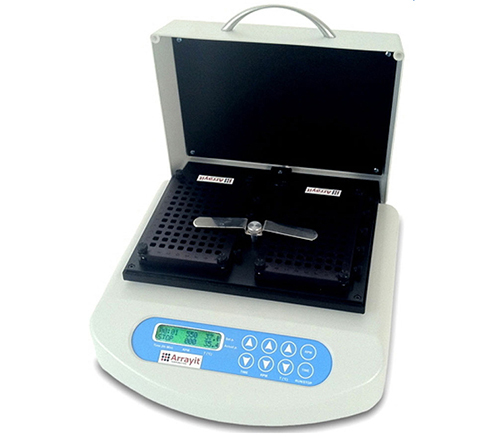 Simultaneously hybridize dozens of microarrays with the Array Plate multiwell hybridization station. It controls temperature, time, and mixing operations for cassette plates or individual tubes. Load between one and four microplates, holding 96 to 384 microarrays on substrate slides, or use the block adapters to load 24 to 96 microtubes for fhybridization and incubation of DNA, protein, peptides, and carbohydrate samples. The alloy block allows fast Peltier heating and cooling and shows cycle progress.